As we are all aging, the fine lines and wrinkles are setting in. With Kleem Organics I have noticed a change in these lines and wrinkles. A good change! Check out the original review by Sweet Cheeks and Savings HERE. If you are wondering how you can get your hands on a bottle of this amazing serum, well... We have a giveaway. Don't just enter the giveaway though. Rush right over to Buy on Amazon! 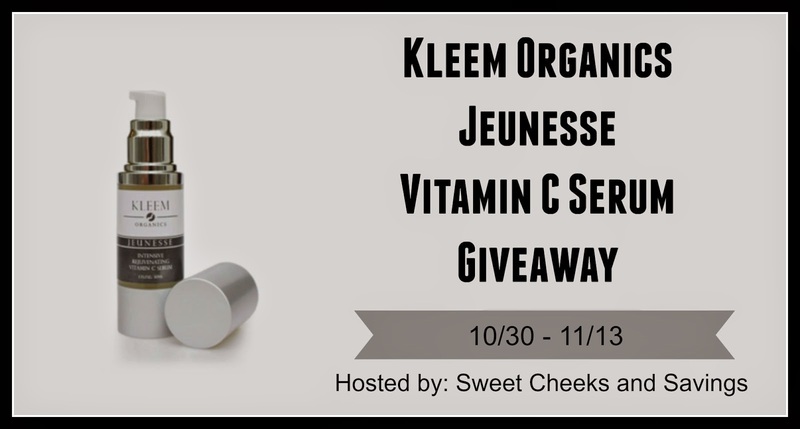 Disclosure: Sweet Cheeks and Savings teamed up with Kleem Organics for this giveaway. Other participating bloggers are not responsible for choosing the winner or shipment of product. They have not receive any compensation for this post. This giveaway is in no way associated with Facebook, Twitter, or Pinterest. The winner will be chose at random by the Giveaway Tool and emailed. The winner must claim the prize within 48 hours or they risk forfeiting the prize. Thanks for this giveaway. What I like the mst is that this serum contains the best Natural & Organic ingredients on the market for our skin. Thanks for this giveaway. What I like about this serum is that it contains the best Natural & Organic ingredients on the market for our skin. The ingredients found in Kleem Organics are the same prescription-quality ingredients you would find in the most expensive pharmaceutical formulas that are only made available at high-end celebrity medical skin spa and treatment centers. These are the exact kinds of ingredients that a plastic surgeon would use on you. I like that they use an airless bottle to contain its Vitamin C serum which doesn't allow air to come in contact with the product, thus preventing oxidation of any ingredients in the bottle and keeping bacteria from contaminating the product. It softens lines and wrinkles. The bottle is designed to dispense only the amount you need so no waste. Vwould love to win this! It is organic & great for deep wrinkles & lines. "Kleem Organics is a skin care company producing cosmetics containing only natural and organic ingredients harvested directly from Mother Nature to deliver visible results without having any negative side effects on the body from chemicals found in more traditional products."